Green Acres is a family owned business operated by Wayne and Lisa Green. 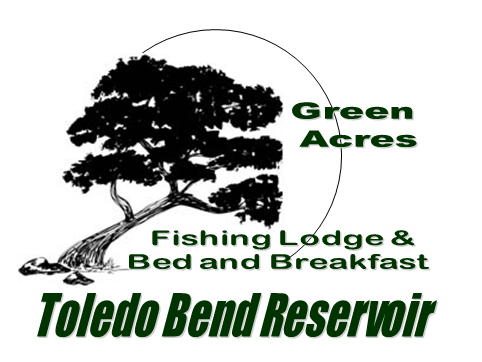 Our Fishing Lodge offers lodging for couples, families, and small groups (bass clubs, family reunions, weekend get a ways, golfers, boaters, bird watchers, etc). We are now offering four different types of accommodations. The "Bird's Nest" is a two bedroom, one bath, 900 sq ft cabin, great for two couples, four fishermen, or a small family. The Bed and Breakfast (which caters to couples) is in the main house/lodge with a King Sized Bed and priviate entrance. We'll make you an fantastic Breakfast each day during your stay. The "Rooster's Roost" which is a large two bedroom open concept facility (private-no sharing with people you don't know). This unit is for one person, a small group/family/club. The Rooster's Roost includes 4 Queen and 4 Twin Beds. We will work with you depending on the size of your group. Our newest cabin is the "Tiger's Den" Cabin which is a one room cabin which is set up for just one or two guests. We built this on request from our fishermen. ***For more information on each cabin, click the tabs on the left side of this page. We are located in the Mid-Lake area of the Toledo Bend Reservoir off of the San Miguel Bay near Zwolle, Louisiana. We are a very small operation where you and your family or a group of friends might be the only ones on this sixteen acre waterfront property during your entire stay. Our goal is to offer you clean, safe, secure (gated property), and comfortable accommodations so you can enjoy your time here on the lake. Additionally, our goal is to have you come back and stay with us again. Hopefully you will find everything you need on this site, if not; we are here to answer any of your questions. Sorry, there is no smoking indoors and no pets allowed at the Green Acres Fishing Lodge and Bed & Breakfast.